Dunbar and Boardman: Marine Elevators – When was the first elevator installed on a Yacht? Marine Elevators – When was the first elevator installed on a Yacht? This week we are returning to our series of world firsts in the vertical transportation industry. If you are new to the blog you may want to read the following posts: Double-Deck elevators, Curved escalators & Travelator. Marine elevators are elevators installed onboard yachts and ships. The production, installation and maintenance of marine elevators is very specialist work. When was the first elevator installed on a ship or a yacht? The first marine elevator installed was on the third incarnation of the Royal yacht, Victoria and Albert III in 1900. The elevator was made and installed by London-based Richard Waygood & Co. Waygood and Co were later responsible for installing the marine elevators in the Titanic. The firm was bought by Otis in 1914 and became part of their company. The lift installation was completed successfully but the yacht did have an accident. The Victoria and Albert III was 380 feet in length, 40 feet in the beam, and draft of 15 feet, giving her a displacement of 4,700 tons. Her double- bottomed hull was made of steel sheathed in wood, and covered in copper. Just before scheduled launch in 1900 the yacht was undergoing final preparations in dry dock. When the dock flooded the yacht toppled over due to 700 tonnes of excessive weight around the centre of gravity of the yacht. The repairs caused a delay in the launch and Queen Victoria never sailed in the new Royal Yacht. 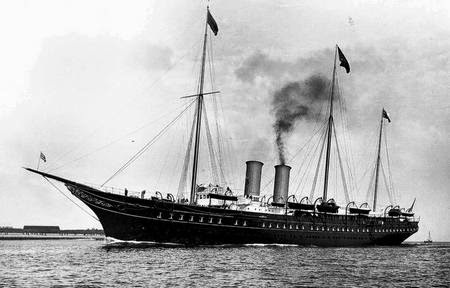 The Victoria & Albert III eventually launched in 1901 and was in royal service for 38 years. What are specific challenges for marine elevators? Marine elevators often require an extremely efficient use of space, weight and to be energy efficient. Any required maintenance has to be managed around a ship’s itinerary. Specialist Marine elevator companies with engineers located around all the world’s shipping routes have been created to enable efficient maintenance. There are also specialised monitoring systems for these lift to operate in rough seas, as well as dedicated power suplies in case of an emergency occurring. What is the Marine elevator market like today? The current marine elevator market is dominated by Kone who have over 50% of the market and have created a specific range of products for each of the following: cruise ships, ferries and cargo ships. Are you working in the marine or offshore environment? Do you have a current or planned project that includes marine elevators or escalators? Nice experience with this blog@! We manufactures and suppliers passenger Lifts and elevators in Delhi NCR.